Today I am sharing with you my favourite go to FOOLPROOF pizza dough recipe. It is so easy an tastes so good, the other day my husband suggested I should make it more often. When you hear someone say “I am making pizza” you automatically think “yeah I don’t have time for that”, but the truth is you do have time for it. The dough only takes about 15 minutes to mix and like 10 to rest. So that’s no excuse. Toppings wise that’s up to you. Another great thing about knowing how to make good pizza dough is that you can use it for other things too rather than just traditional pizza. In fact you can use this dough to make the awesome Preztel Bites by Annika, you can find the full recipe for that here. In this post I don’t focus on toppings, in fact I only list the Margherita ones. This is because with topping the sky is the limit. 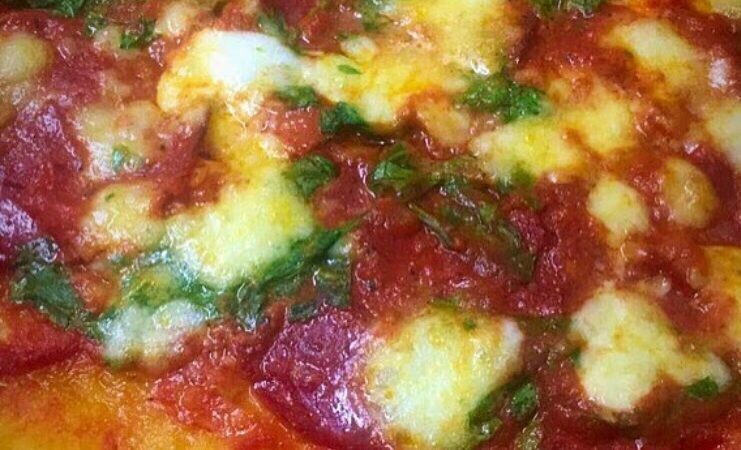 On the pictures at the end of the post you can see a slice of my Margherita pizza and a picture of the my Spanish Chorizo and spinach pizza (we are OBSESSED with the Halal Spanish chorizo from Tesco). In a bowl, mix your yeast with around 2tbs of warm water and sugar. Stir it and set it aside for around 5 minutes to “activate” the yeast. It’s ready when the top is starting to look sort of frothy and bubbly. Now start with 1 cup of flour, the dried oregano and mix well, keep adding warm water and flour until you have used all your flour. The dough should be soft and malleable and not too sticky. If it breaks apart it means there is not enough water so just add a bit more. If it’s extremely sticky add flour. Roll it into a ball, cover and leave to rest for at least 10 minutes. Once you are ready to use your dough, make sure you have a clean surface and drizzle some flour on it, then put half of your cough on it and start rolling. Flip it on its opposite side after every few rolls and sprinkle more flour if needed. Keep doing this until you have the thickness that you desire. I personally like a thin crust so I roll for about 10 minutes. Brush some olive oil mixed with oregano and basil onto the whole “pie”. Drizzle some flour onto the dish you are going to use. Now you can carefully and quickly transfer your pizza dough onto the pan and put the oiled side at the bottom and then brush the top side with oil. It doesn’t matter what order you do it in as long as both sides are oiled. To make life easier you can roll your dough directly on some baking paper but still remember to oil both sides, flour the bottom side and weight the corners of the paper down so that it doesn’t slide away when you roll. Add your sauce and put it in the oven. Bake for 15 minutes or more if it is thicker. Once your crust is cooked, it should look golden and if you check the bottom of it you should be able to tell. Now add the mozzarella and cook for a further 10 minutes until it has all melted and is bubbly. Oregano in the crust is a nice touch! Great recipe! Thank you, it’s such a simple herb and it makes so much difference. Looks great! I assume the oil prevents sticking? I usually par-bake for a while and then do the rest but I will definitely try the oil! Yes the oil helps to prevent sticking and I also find that it enhances the flavour as well as giving the crust a nice golden colour. I haven’t tried par baking it, i might do it next time. I have never done a collab but would love to. This looks amazing!! I am definitely going to be saving this recipe because this looks delicious! Thank you for sharing!